Originally from the Imperial Valley, CA, Emilio C. Ulloa earned his BA in Psychology from San Diego State University in 1997. He earned a Ph.D. degree in Social Psychology from Arizona State University in 2003. His research focuses on understanding the etiology and effects of physical, sexual, and emotional violence among adolescents, young adults, and college students. Prior to completing his doctoral work at Arizona State University, Dr. Ulloa worked as a graduate research intern with the RAND corporation in the Washington D.C. area. Upon completion of his degree, he joined the faculty of the Department of Psychology as the Director of Undergraduate Advising and Programs at SDSU from 2003 to 2015. In 2015 Dr. Ulloa served as the Director of the Educational Opportunity Programs and Ethnic Affairs office, which provides services to low income, first generation SDSU students. Dr. Ulloa has served the university in a variety of capacities, including as a member of the WASC accreditation committee, as a member of the University Student Learning Outcomes Committee, as the chair of the Student Research Symposium, as a member of the Academic Senate, as chair of the Senate Committee on Committees and Elections, and as founding co-chair of the University Campus Advisers. Since 2013 Dr. Ulloa has served as the lead researcher for the SDSU Sexual Violence Campus Climate Survey. Dr. has served as a program review site visitor for different psychology programs and for the American Psychological Association Committee on Accreditation, has served as a journal reviewer for several peer reviewed journals in the social sciences, and on the editorial board of the journal Cultural Diversity and Ethnic Minority Psychology. Dr. Ulloa has taught undergraduate courses including Introduction to Psychology, Social Psychology, Chicano Psychology, and Careers in Psychology. Dr. Ulloa is committed to issues of diversity in higher education. He is a long-time member of the advisory board for the Minority Access to Research Careers Program (MARC) and he was the Director and PI of the SDSU NIH/NIGMS funded Minority Biomedical Research Support program. 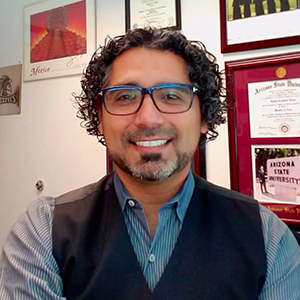 Dr. Ulloa has served as a member of the University Diversity Equity and Outreach Committee, and as a member of the committee for the Recruitment and Retention of Underrepresented Faculty and Staff. He has also served from 2005-2013 as the coordinator of the Diversifying Clinical Psychology Recruitment program for the Council for University Directors of Clinical Psychology. During his time as an advising administrator at SDSU Dr. Ulloa has been recognized nationally by NACADA, and locally by SDSU for his exemplary advising. In 2018 he earned the Provost's Award for Innovative Excellence for his work with the College of Science Student Success Center. He has also earned awards for his mentoring: being honored with the Most Influential Faculty Award, the Mortar Board Outstanding Faculty Award, and the Quest for the Best Faculty/Staff Award. He joined the College of Sciences Deans office as the Director for Advising in 2016. B.A., San Diego State University, Psychology, 1997. Ph.D., Arizona State University, Psychology, 2003. Physical, Sexual, and Emotional Violence among Adolescents, Young Adults, and College Students; Commercial sexual exploitation of children/CSEC; Romantic Relationship Violence. Ulibarri, M. D., Ulloa, E. C., Speed, E. A. (2017). Research, treatment, and policy regarding trafficking and sexual exploitation of children and adolescents: Introduction to Special Section. Journal of Child and Adolescent Trauma 10, 2;147-149. Ulloa, E. C., **Hammett, J. F., *Meda, N. A., & *Rubalcava, S. J. (2017). Empathy and Romantic Relationship Quality Among Cohabitating Couples: An Actor–Partner Interdependence Model. Journal of Family Psychology 25, 3; 208-214. Ulloa, E. C., Dyson, R. B., & Wynes, D. (2012). Inter-partner violence in the context of gangs: A review. Aggression and Violent Behavior, 17, 5:397–404. Filson, J., Ulloa, E. C., Runfola, C., & Hokoda, A. (2010). Does Powerlessness Explain the Relationship Between Intimate Partner Violence and Depression? Journal of Interpersonal Violence, 25, 3, 400-415. Buelna, C., Ulloa, E. C., & Ulibarrri, M. D. (2009). Power as a Mediator of the Relationship between Dating Violence and Sexually Transmitted Infections. Journal of Interpersonal Violence, 24, 8, 1338-1357. Ulloa, E. C., Jaycox, L.H., Marshall, G.N., Collins, R.L. (2004). Acculturation, Gender Stereotypes, and Attitudes about Dating Violence among Latino Youth. Violence and Victims 19, 3: 273-287.